In many regions of the developing brain, spontaneous depolarizing waves of activity are observed, driven by intrinsic cell properties, not by external stimuli. In each region, the SA is mediated by different mechanisms. In the brainstem, SA is driven by midline cells in the former rhombomere 2 region, and the SA depends on 5HT receptor signaling. The waves propagate widely within the brainstem, with each embryonic stage having a unique spatiotemporal wave pattern. Over view of SA. 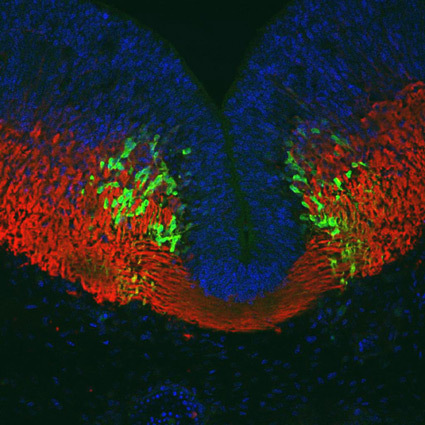 Cartoon of the open-book E11.5 hindbrain: red indicates the trigeminal (nV) or facial (nVII) motor neurons, axons and exit points (EP); green circles are the newly differentiated rostral serotonergic raphe cells. Over 85% of spontaneous events originate in the initiation zone (green box) in the rostral hindbrain. The right composite image shows a single intracellular transient in the InZ, which then propagates rostrally and caudally; the imaging events are superimposed on an image of the hindbrain. In mouse hindbrain, >90% of the neurons in the initiation zone are 5HT-positive; SA is dependent on 5HT receptor signaling, thus indicating that serotonergic signaling is important to brainstem SA.